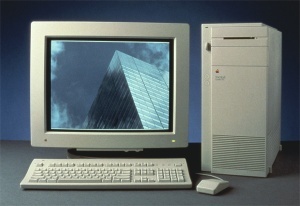 The Quadra 700/900 provide the highest built-in video performance of any Macintosh CPU to date. In a (very) simplified graphics model, we could say that performance depends on two main factors: processor horsepower and the bandwidth the processor has into frame buffer memory. These machines already have a fast processor - the 68040 - which runs standard 32-bit QuickDraw. To provide high bandwidth into frame buffer memory, dedicated video RAM (VRAM) was used for the frame buffer, and that VRAM was placed directly on the 68040 processor's local bus. This provides the 68040 the same access time into frame buffer memory that it has into main system RAM. (Transfer rates can exceed 40 MBytes/sec.) In addition, memory options such as fast page mode are supported, which can improve graphics performance for operations such as scrolling, offscreen-to-onscreen pixmap transfers, etc. In a number of cases the design was optimized for high performance over low cost. A good example of this is 32 bpp operation on Apple's standard 13-inch RGB monitor at 640 x 480 resolution (and this also applies to VGA and NTSC), which is probably the most common color monitor in use on the Macintosh. The actual number of memory bytes needed to support 24 bpp is 640 x 480 x 3 = 921,600. This would seem to fit within 1 MByte of memory (as is the case with the Apple 8*24 video card), but the Quadras actually require 2 MBytes of VRAM for this mode. The 8*24 card supports 24 bpp at 640 x 480 by using a storage mode called 'chunky planar' to fully utilize all its 1 MByte of VRAM. However, this results in having to perform 3 separate memory accesses for each 24-bit pixel read from or written to the frame buffer. (This is done in hardware so software only performs a single read or write.) On a NuBus video card, this inefficiency is partially masked by the synchronization delays which occur at the processor-bus/NuBus interface. However, when frame buffer memory is placed directly on the processor bus, this approach results in a nearly 3X performance degradation. This was judged unacceptable for the Quadras. Each 24-bit pixel occupies one longword (4-bytes) in VRAM, so the Quadras actually provide 32 bpp for the 640 x 480 resolution. This pushes the memory requirement for this mode over the 1 MByte boundary (640 x 480 x 4 = 1,228,800 bytes). Performance is improved still more by another frame buffer architectural feature. Frame buffer memory in the Quadras is organized into 4 'banks' of 512 KBytes per bank. As mentioned earlier, Quadra VRAM can operate in fast page mode. In addition, each bank of VRAM operates in fast page mode independently of the other 3 banks. This causes the number of in-page 'hits' to increase, and thus improves the effective bandwidth into the frame buffer. Also, at 32 bpp, 640 x 480 resolution, each row is set to 4096 bytes, or 1024 32-bit pixels. Each successive row is assigned to a different VRAM bank (modulo 4, of course). This memory organization improves performance during certain commonly performed graphics operations such as vertical scrolling. In any design there are a number of tradeoffs to be made, and this is certainly true for the frame buffer in the Mac Quadra machines. While the video does operate at 32 bpp on up to 16-inch displays, it does not support 21-inch displays at this pixel depth since this would have significantly raised the cost of the motherboard. (Memory capacity and bus bandwidths would essentially have to double, and this would be expensive.) It does support NTSC and PAL timing, but does not provide a composite video output. While it is much faster than any non-accelerated video card, there are accelerated video cards that are faster (and much more expensive, too, by the way). A separate graphics processor was not added primarily for cost reasons. However, a graphics processor such as the 29000 RISC chip on the 8*24GC card can only speed up the graphics operations that it was designed to know about. If an application program bypasses QuickDraw (which is what most Mac graphics accelerators are designed to speed up), a graphics accelerator will not improve performance, and can actually cause a performance degradation. This page was last modified on 10 April 2019, at 13:05.